A new lawtech innovation hub launched jointly by Barclays and The Law Society has unveiled its first batch of start-up residents. 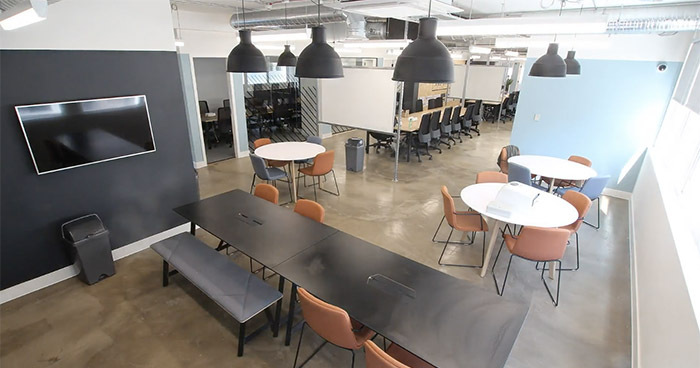 As reported by Legal Cheek in April, the ‘Eagle Lab’ incubator can accommodate up to 100 lawtech minded entrepreneurs at its trendy Notting Hill office space (pictured top). The hub is backed by a host of law firms including magic circle duo Allen & Overy and Clifford Chance, as well as: Baker McKenzie, Clyde & Co, DWF, Latham & Watkins, Gowling WLG, Norton Rose Fulbright, Simmons & Simmons and TLT. Several months on, the identities of Eagle Lab’s first batch of residents have now been confirmed. The first start-up given the nod is ayfie, a text analytics tool that combines natural language processing and linguistics to “extract insights from unstructured data”. ayfie was founded in 2009 and is headquartered in Oslo, Norway. Next up, Ginie AI. This London-based start-up’s machine learning technology can help lawyers customise complex contracts by recommending clauses and boasts ex-Supreme Court president Lord Neuberger as one of its advisers. Other Eagle Lab residents include Legatics, a platform that optimises and automates legal processes, and law firm compliance and collaboration tool Annotate. So what can the start-ups expect in the way of support? According to those behind it, Eagle Lab will provide a space where entrepreneurs and developers can tap into the City’s top legal minds, while the universities involved, UCL and the University of Liverpool, will provide academic input. Eagle Lab is by no means the first law-focused innovation hub. City outfits who have launched similar initiatives in recent years include Dentons, Mishcon de Reya, Reed Smith and Allen & Overy. We need to give teachers and nurses a pay rise! The NHS is massively underfunded! VOTE CORBYN, FOR THE MANY, NOT THE FEW!!! JC will tax lawyers and bankers – make them pay!!! Vote Labour, put an end to it NOW! It is neither an incubator nor a Lab. Its a room where people work on computers. Are these all comments from Russian subversion bots?